Royal Blue Phifertex Standard Solids Fabric is a durable vinyl coated polyester mesh with an open weave. It’s breathable, easy to clean, tear resistant, fade resistant, and mildew resistant with Microban to prevent stain- and odor-causing bacteria. It has a wide range of uses, including, market bags, tote bags, sunscreens, outdoor cushions, and elevated dog beds and cots. It can be sewn with a sewing machine. I chose this fabric for my snowmobile vents. It's lightweight and will let air in/ heat out with minimal snow able to pass through. This is a great quality mesh fabric. I use it all the time. Durable material at a decent price. Used in making dog beds for animal shelter. Recommended on a Suitablility pattern for horse gear. Hope to use it to replace slings looks strong and weather resistant. This mesh works great for beach tote bags. is it too thick for a sewing machine? What would you use to attach it to pvc, for dog bed. BEST ANSWER: I use lath screws - that way it's easy to adjust. They will sag over time with the weight of the dog. No, it is not too thick for a sewing machine. Make sure you have a sharp needle before you start. Will this work well for outdoor cushions (top and bottom) and how long is it rated to be in the sun? Wanted to sew fly masks for horses the pattern suggested this type fabric is this doable for this purpose? Can pfifertex fabric be ironed? BEST ANSWER: I havent but if you do it would need to be a very cool iron and possibly using an iron mat for when using visofix. I often roll it out flat and place something heavy such as books on it to help flatten it. Hope that helps. what type of thread is used for sewing? BEST ANSWER: I didn't use a thread to sew this "fabric". I just cut it into the correct size piece to use as a cover to provide shade above my deck. If I were using a thread, I would chose polyester or a cotton covered polyester. However, long term use of cotton would disintegrate if it were kept out in the sun---which is where mine was being used. If you could find a heavy duty polyester, that would probably be the best. Will this work for a lounger that floats in the pool? BEST ANSWER: It should work just fine for that. I use it for my dog kennel beds, so I'm always sanitizing them - they dry fast. And will hold dogs well over 100 pounds - HTH! We cannot say how it will hold up to chlorine. Avoid direct contact with oil based products such as tanning oil, if direct contact occurs, clean promptly. Can this be purchased by the full roll? what is the working temperature if I wanted to be 175°F would this material last ? BEST ANSWER: I just put a piece off it in from on temp gun and it melted pretty fast. Think 120°F is the max. Hope this helps. I made 2 personal dog cots and 4 for my local humane society. Holding upper pretty well. The humane society bleached them everyday. Can this be installed in a pool enclosure to Blake ck the view of adjacent building? BEST ANSWER: Yes, it is a bit see through but will block a lot of the view. We recommend ordering a sample to be sure that it will work for your project. BEST ANSWER: However long you want it to be! It's sold by the yard, so order the quantity you want. Is this vintl coated mesh easy to sew with a standard sewing machine? BEST ANSWER: It is as long as you have a sharp needle. 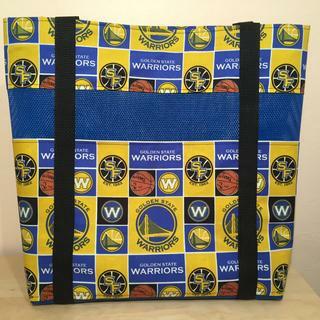 My son works for the the Golden State Warriors so I am proud to carry my tote.